From the Department of Radiology, The University of Iowa Hospital and Clinics, 200 Hawkins Drive, Iowa City, IA 52242. Central nervous system vasculitis (CNSV) is a rare inflammatory disease associated with many causes (1) that usually involve the small vessels of the parenchyma and meninges (2–4). Despite its rarity, vasculitis is suspected daily. Diagnostic angiography is frequently requested to rule out vasculitis, although angiographic findings are uncommon (5–10). Because CNSV is a serious disorder, prompt diagnosis and initiation of therapy are essential for a positive outcome (9, 11, 12). In addition, exclusion of CNSV is important because patients have to commit to long-term, expensive immunosuppressive therapy that carries a risk of significant morbidity. The diagnosis of CNSV is mainly a process of exclusion, because the clinical and laboratory findings are often unrevealing (1). Unfortunately, a definitive diagnosis frequently requires invasive procedures, including angiography and brain biopsy. Diagnostic confirmation from these procedures remains low in patients with clinically suspected CSNV, and depends on what tissue is obtained during biopsy (the site of inflammation) and when angiography or biopsy is performed (the time of active inflammation). Owing to their invasiveness and cost, the justification for these procedures to exclude such a rare disease is confounded by the current cost-conscious health care environment. The need to find a noninvasive diagnostic test is imperative for patients with suspected CNSV. Previous reports have suggested various imaging protocols that improve diagnosis of CNSV. Harris et al (5) studied 92 patients selected for angiography to exclude CNSV⇓, of which 70 (76%) also had MR, and only 11 (12%) had confirmed CNSV. Positive angiographic findings were present in 73% of the pathologically proved cases and in 9% of the clinically suspicious cases of CNSV. All patients with CNSV had significantly abnormal MR findings. The investigators concluded that negative MR findings exclude CNSV more definitively than do negative angiographic findings. The likelihood of finding vasculitis with angiography is negligible in patients with normal findings on MR studies. Therefore, an MR examination should be performed first, and angiography is only indicated if the MR results are abnormal. Greenan et al (13) preferred a different approach based on their experience in seven patients with CNSV findings⇓. They found abnormalities in 27 (82%) of the 33 vascular distributions on angiograms and 33 parenchymal lesions on MR images. All seven patients had positive MR findings, and all the lesions identified on MR images were associated with positive angiographic findings. Twelve (36%), however, did not have a corresponding MR-revealed lesion. The authors concluded that some patients with proved CNSV may have normal MR results; therefore, angiography should be the technique of choice when excluding CNSV. In this issue of the American Journal of Neuroradiology, Pomper et al (page 75) report their MR and angiographic findings of CNSV in 18 patients with autoimmune disease. A positive angiogram was one of the selection criteria for their patient population. Only four patients had a pathologic specimen available and one of the four patients had a negative result for CNSV. Similar to the results of Harris et al (5) and Greenan et al (13), they also found that all patients with CNSV had abnormal but nonspecific MR findings. These MR abnormalities are commonly found in a wide range of diseases (1). Only 65% of the MR-revealed lesions were evident on angiograms, and only 44% of the angiographically revealed lesions were evident on MR images. They concluded that these two techniques provide different information about CNSV and that both types of information are needed for complete assessment of the damage caused by vascular abnormality. The search for better imaging of CNSV should be informed by fundamental principles related to CNSV and imaging alternatives. These principles include the primary causes for the patient's clinical presentation, the size and location of the vessel involved, and the variety of information that can be shown with various imaging techniques. The unique features of CNSV should determine which diagnostic or pharmacologic treatment decision would be most effective. Regardless of the source for the vasculitic lesion in CNSV, the primary disease process is the ischemia or infarction that results from regional hypoperfusion and causes the neurologic symptoms that bring the patient to medical attention. Although the primary underlying disease process is not much different from that of typical ischemic stroke, CNSV has been considered as a separate entity partly because characteristic radiologic findings and clinical presentations typical for ischemic stroke are lacking. Because CNSV predominantly involves small vessels, the resulting parenchymal lesions, (ie, infarction) depicted on conventional MR images tend to be small and are unlikely to have characteristic wedge-shaped configuration or follow a vascular distribution. Although conventional MR imaging is valuable in depicting small parenchymal infarctions, these findings are not specific for CNSV (6, 13). In addition, conventional MR imaging is not sensitive for evaluating the ischemic (symptomatic) but uninfarcted tissue that may frequently occur in CNSV because of various inflammatory processes that contribute to the progressive and intermittent nature of this type of occlusion. This disease process counters the acute occlusive phenomena that typically lead to acute stroke. Furthermore, oligemic (asymptomatic) parenchyma can coexist, and its presence can be useful in the diagnosis of CNSV; this, however, also cannot be shown by conventional MR imaging. There are also limitations to conventional angiography in the diagnosis of CNSV. The resolution of angiography is about 500 μm, which cannot depict the predominant small-vessel disease involved in CNSV (15). Angiography provides evidence of vascular abnormality involving the medium to large blood vessels. This type of vascular lesion occurs less frequently in CNSV, and may not always account for a patient's symptoms. A positive angiogram indicates CNSV, but a negative angiogram cannot exclude the disease. MR imaging, on the other hand, provides evidence of parenchymal damage that results from the vascular abnormality of all vessel sizes, including the microvasculature, that is frequently seen in CNSV. Because CNSV is predominately a small-vessel disease that causes ischemia or infarction of the associated parenchyma, MR imaging is likely to be more sensitive but not specific for the diagnosis of CNSV. Conversely, angiography is only capable of detecting vasculitic lesions of larger blood vessels and therefore is less sensitive, but specific, for CNSV. Pomper et al, therefore, are logical in suggesting that MR imaging and angiography complement each other, and both are needed for complete assessment of patients in whom CNSV is suspected. Obviously, we are attempting to reconcile opposing issues: 1) it is difficult to justify performing both MR imaging and angiography for a disease that is not frequently encountered in our daily practice; 2) it is critical to establish the correct diagnosis of CNSV in order to initiate prompt therapy during its acute phase; and 3) it is important to exclude asymptomatic patients without CNSV as candidates for long-term immunosuppressive therapy. The fact is that many symptomatic patients will have inconclusive angiographic and MR findings, owing to the limited resolution of the former and the nonspecific results of the latter. Perhaps another factor influencing the effectiveness of angiography and MR imaging in the diagnosis of CNSV is that neither technique provides direct information about the primary underlying disease process—hypoperfusion. Therefore, a noninvasive technique that can reflect additional information about hypoperfusion (Figs 1, 2) or indicate an early and subtle ischemic change in brain parenchyma (Fig 3) may improve the diagnosis of CNSV. We believe perfusion MR imaging has great potential because it provides direct information related to regional hypoperfusion caused by small vasculitic lesions. 1. CNSV was diagnosed on the basis of perfusion imaging findings in a patient with acute and profound neurologic symptoms related to the left hemisphere. The clinical impression was acute stroke caused by occlusion of the left internal carotid and cerebral arteries. The angiogram (not shown) was negative for CNSV. The patient made a complete recovery a few days after initiation of steroid therapy. A, FLAIR image shows nonspecific white matter disease of both hemispheres. 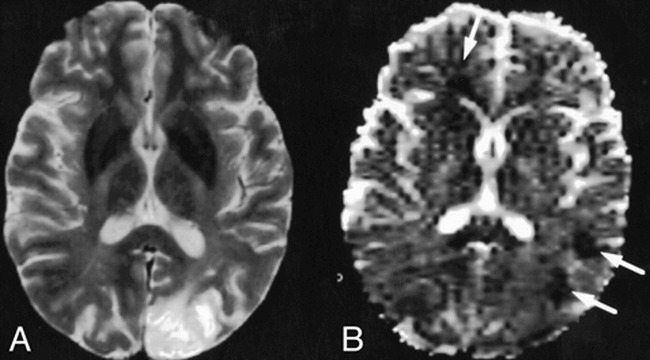 B, Perfusion image shows extensive abnormality involving the left hemisphere, including decreased cerebral blood flow (hyperintensity on rMTT map). C, Perfusion image shows decreased cerebral blood volume (hypointensity on the rCBV map). fig. 2. CNSV was excluded on the basis of perfusion imaging findings in a patient with remote and recent brain infarctions and a clinical suspicion of CNSV. Brain biopsy along the left anterior cerebral artery (ACA) distribution was performed immediately after the negative perfusion findings that depicted normal vasculature were obtained. 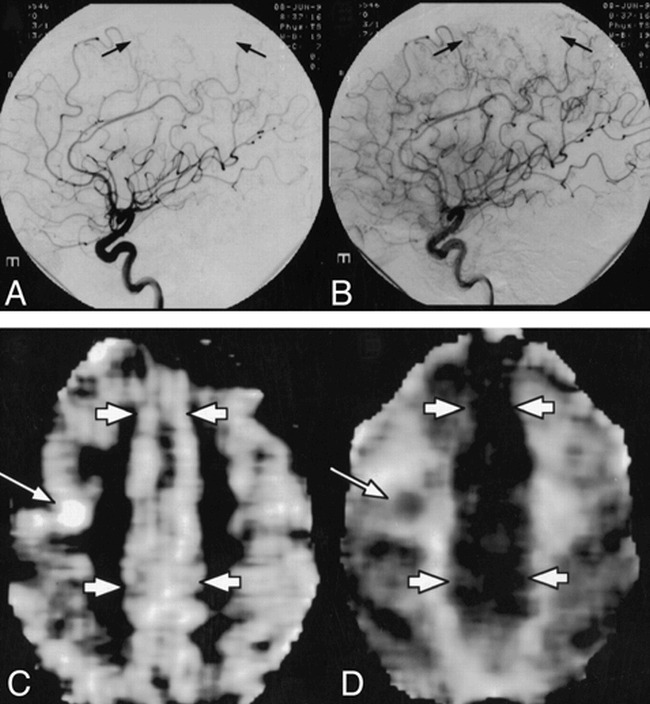 A and B, Early (A) and late (B) arterial phase of the left internal carotid artery angiogram shows a paucity of arterial staining in the parietal lobe along the ACA distribution (arrows). Similar findings were also noted on the angiogram of the right internal carotid artery (not shown). C and D, Perfusion MR image was obtained concurrent with the CBV map (C) and the MTT map (D) and showed normal perfusion of brain parenchyma along the ACA distribution (short arrows). An incidental finding of a recent infarction (long arrows) in the middle cerebral artery distribution is also noted. CNSV was diagnosed by diffusion imaging. Findings were consistent with multiple, small-vessel ischemic disease in that they did not depict vascular distribution, a characteristic finding in CNSV. A, T2-weighted MR image shows an old left occipital infarction that is not specific for the diagnosis of CNSV. B, The corresponding ADC map shows three additional acute ischemic lesions (arrows). We have seen cases in which both conventional MR imaging and angiography were unrevealing, but the perfusion imaging depicted profound perfusion abnormality (Fig 1). We initiated steroid therapy without ordering a brain biopsy based on the perfusion imaging findings, and all patients showed dramatic clinical improvement. Diffusion imaging can also be a potentially effective tool in the diagnosis of CNSV because it can show small and active ischemic changes, not visible on conventional MR images, that may explain the patient's ongoing symptoms (Fig 3). Although diffusion imaging changes are not as direct as perfusion imaging in the reflection of the primary vascular distribution of disease in a symptomatic patient, they can certainly narrow the differential diagnosis. Another advantage of the noninvasive nature of diffusion and perfusion imaging is their capability for repetitive scanning; a positive finding for CNSV hinges upon the timing of the study. Parenchymal ischemia or infarction, a consequence of diminished regional blood flow (hypoperfusion) that results in small-vessel inflammatory disease, is the primary underlying source of the symptoms of CNSV. MR imaging and angiography provide different types of information. MR imaging is more sensitive but not specific, whereas angiography can certainly improve the accuracy of CNSV diagnosis. This approach is limited, however, because both techniques reflect indirect information about hypoperfusion. Furthermore, MR imaging and angiography will most likely be inconclusive in the majority of patients with clinically suspected CNSV, and the justification for both studies to diagnose a rare but commonly suspected disease remains debatable. With the introduction of new functional imaging techniques, the diagnosis of CNSV can potentially become more cost-effective and noninvasive. Hypoperfusion, the primary underlying disease process of CNSV, can now be directly assessed at the microcirculatory level with perfusion imaging. Diffusion imaging can readily detect early ischemia and infarction, characteristic findings of CNSV that may not be revealed by conventional T2-weighted MR imaging. Most important, any effort to boost the accuracy of CNSV diagnosis should expedite treatment and thus improve outcome. Perhaps it is just as important to have the capability to exclude a diagnosis of CNSV in a symptomatic patient with clinically suspected CNSV and, therefore, prevent a long-term commitment to immunosuppressive therapy. ↵1 Address reprint requests to William T. C. Yuh, MD.